The Richmond Town Hall has been rescheduled for Tuesday, April 23 from 7 to 9 pm at St. Philip’s Parish Hall (127 Burke Street) . We look forward to seeing you there. The Munster Town Hall has been rescheduled for Saturday, May 4th from 10 am to 12 pm at the Munster Community Centre (58 Dogwood Drive). For more information, visit: manotickmiler.com. Spend a fun afternoon being creative and learn to make these Kusudama origami flowers at the Manotick Library. This pretty flower is relatively simple to fold, but sure to impress all of your family and friends. Registration required at https://BiblioOttawaLibrary.ca. Manotick Community Church will be hosting The Big Give again this year. They will be having a huge free garage sale in their parking lot (5492 South River Drive, across from the library) and will be giving away free coffee and treats, free BBQ lunch, free face painting and much more. This all happens on Saturday June 1 (Dickinson Days!) and over 100 churches across the city (and country) will be doing similar events. We are currently looking for donations of clothing, household goods, appliances, sporting equipment, etc. Pickup can be arranged. Anyone wishing to donate can contact Rosemary MacPherson (rosemary@celtic.ca / 613-292-3023). The Scott Moffatt Golf 4 Youth Classic is back! The tournament will be on Friday, July 5th at the Canadian Golf and Country Club. Last year, this event raised over $20,000 for Youth of Manotick Association and the Richmond Youth Centre! We are currently in the process of obtaining sponsorships for the tournament. 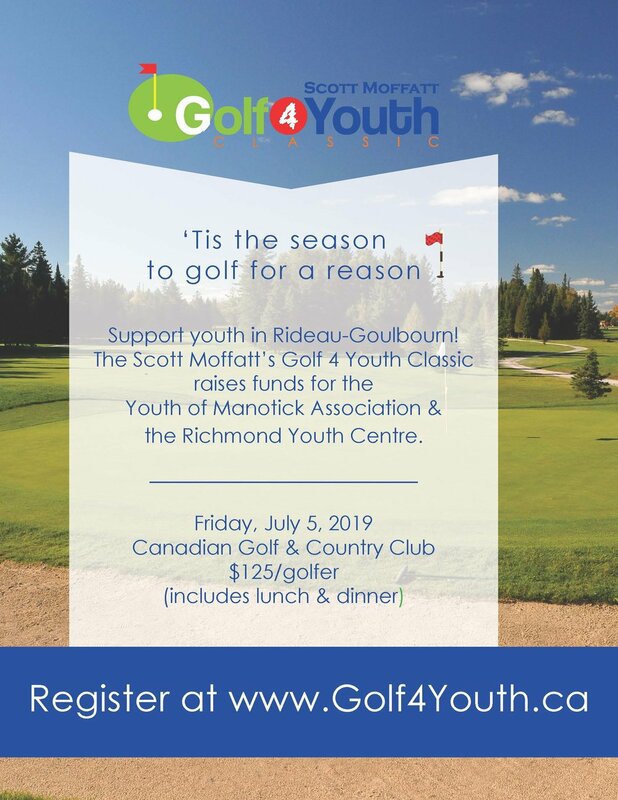 For more information or to buy tickets, visit: golf4youth.ca. We look forward to the annual Classic which raises funds for youth in our community! Details will be published at a later date at: www.manotickvca.org/mvca-events. Details will be published at: www.richmondfair.ca. Details will be published on: raceroster.com/events/2017/12592/great-gower-run. Details can be found at www.9runrun.ca. Our next "Drop in to Chat" session will be on Wednesday, April 17th at the Goulbourn Town Hall (2135 Huntley Road) from 10 am to 3 pm. We host "Drop in the Chat" sessions on the 1st and 3rd Wednesday of every month at different locations across the ward. On these days, you are invited to stop by to chat about any concerns or issues that you have! Our following session will be on Wednesday, May 1st, location to be determined. If there's a specific location you'd like us to hold one of these sessions, please let us know! We are open to suggestions. The Kars Town Hall has been rescheduled for Monday, April 15th from 7 to 9 pm at the Kars RA Centre (1604 Old Wellington Street). Presented by Zalasmarts: Children will be introduced to the concept of money, and learn about their local currency (understand why a $5 bill is worth $5) as well as a brief introduction to other currencies. Learn about money basics and various types of currency in a FUN and interactive way! ZalaSmart is a company geared towards teaching kids, teens and youth essential life skills, starting with financial literacy. We do this via fun and interactive programming, which embed money management concepts through storytelling, experiential learning and games. Join us as we explore the magic of Iris folding, learn how to fold paper to make intricate patterns for greeting cards and other decorative crafts. This technique only takes seconds to learn and yields beautiful results that can be used to create homemade greeting cards or pictures that will be cherished by friends and family. Participants will leave with a completed card and the skills to make more at home. Registration required at https://BiblioOttawaLibrary.ca. Our "Drop in to Chat" sessions will commence on Wednesday, April 3rd and will be held twice a month, on the 1st and 3rd Wednesday of every month from 10 am to 3 pm. The first session will be on April 3rd at our North Gower Ward Office, 2155 Roger Stevens Drive. On this day, my team and I will be available for residents to stop by to chat with us about any concerns or issues. We will continuously advertise the dates and locations in this E-Newsletters, in the Councillor's Manotick Messenger column, on our Rideau-Goulbourn social media channels and on www.RideauGoulbourn.ca. Join us and create a very simple Zentangle and add some colour using bleeding tissue paper and water! Spend a fun afternoon being artsy at the Manotick Library. Registration required at https://BiblioOttawaLibrary.ca. Join us and create a very simple Zentangle and add some colour using bleeding tissue paper and water! Spend a fun afternoon being artsy at the North Gower Library. Registration required at https://BiblioOttawaLibrary.ca. Drop in for puzzles, board games and LEGO! Family activity at the Manotick Library! Learn to turn a flat piece of paper into something three dimensional such as a bird, frog or other animals using the technique of Origami paper folding at the North Gower Library. For ages 6 and up. Drop in! Come learn about the different languages and methods spies used to communicate during the Cold War. Our trained spies are going to teach you all about the unusual languages, codes, signs, and ways spies use to send and receive messages. So say goodbye to Morse Code and come learn about all the other great languages of spies. Ages 6-12. Registration recommended. Make sense at the Manotick Library! Mingle colours, shapes, smells and materials. Ages 4-6. Registration recommended but not required. Let your imagination tower at the Manotick Library! Ages 6-9. Registration recommended but not required. Come join us for a fun blend or stories and songs at the Manotick Library. All ages, drop in. Come and learn about local artist Eric Walker who uses found materials to create images about transportation and city-scapes. After a short presentation about Walker’s practice, children will create their own collage artworks using new and recycled materials. Ages 2 – 10. Registration required at https://BiblioOttawaLibrary.ca . Fuse crafts and science to create fun at the Manotick Library! Ages 7-9. Registration recommended but not required. Join us for crafts and activities at the Manotick Library, prepare to get messy! Ages 2+. Registration recommended but not required. Holy Trinity Anglican Church, North Gower is having its annual Pancake Supper on Tuesday, March 5th at the Alfred Taylor Community Centre from 5:00 to 7:30 PM.